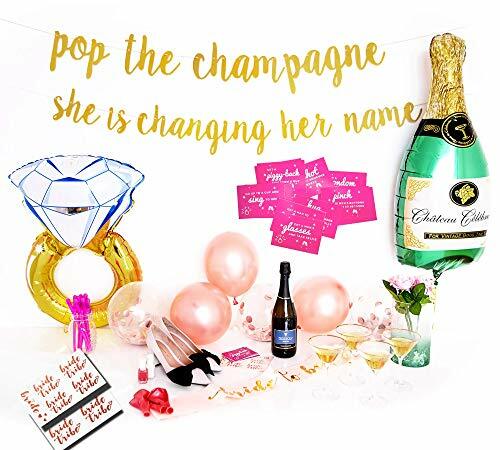 Our ˝Pop The Champagne She Is Changing Her Name˝ banner is made from a card-stock with a glittery gold finish. Gold twine rope (5 ft.) is included. The premium quality makes our rose gold sash with gold lettering stand out. It is made of double lace fabric with silk feel. 31 inches long sash is suitable for all shapes and sizes. The Bridal Wedding Veil with comb is the perfect length of 28 inches. Plastic comb is sewn on the veil and is easy to wear. The bachelorette party will be trendy with 6 premium rose gold and 6 premium confetti rose gold balloons. The champagne bottle foil balloon (40˝ tall) and ring foil balloon (30˝ tall) can be inflated with air or helium. Both foil balloons are self sealing. Filled with helium, they float and are a great effect for any bachelorette, wedding or engagement party. Metallic temporary rose gold 9 Bride Tribe + 1 Bride flash tattoos are a must bridal party accessory. They are easy to apply and should last a day or a night with no problems. Fun night out with the girls is now guaranteed with these funny looking pink color p*nis shaped straws. Straws can be reused. This pack of 10 high quality dare cards was made just for our bundle. A sure way to get the bridal shower started with lots of laughter!  BACHELORETTE PARTY DECORATIONS KIT FOR AN ELEGANT BRIDAL SHOWER OR ENGAGEMENT PARTY - Say hello to the best Bachelorette Party with these amazing premium Bachelorette Party Decorations. Bride and bridesmaids will love this bachelorette set, it includes everything that u need for the best bridal party, from the comfortable Double Layered Satin Sash to the Bride Tribe Flash Tattoos that will make you stand out everywhere you go.  PREMIUM CONSTRUCTION, ELEGANCE AND CLASS - From the double layered materials used in the Rose Gold Sash and the gold glitter »Bride To Be« font, that every bride would be proud to wear, the gold glittery Pop The Champagne She Is Changing Her Name banner that u can hang on a wall or outside to the latex Balloons and Champagne bottle and Engagement Ring Balloons, it is all about our customers.  SIMPLE, ENTERTAINING AND FUNNY - Entertainment is the second part of our Bachelorette Party Decorations Kit. With metallic temporary Rose Gold Bride Tribe Flash tattoos, funny reusable drinking straws, add an interesting flair to your bachelorette, coctail party. Unique and simple bachelorette dare cards, but very entertaining, funny and easy to play. A great way to get the bachelorette party started with lots of fun and laughter. Perfect for any girls night out!  GREAT GIFT IDEA: Why sit at home and do nothing, when you can buy a perfect Bridal Shower Supplies for a fun girls day/night out, when your best friend is getting married. Have fun, laugh and enjoy with your friends. So shop with 100% confidence, if you are not happy with the purchase for any reasons, contact us for an exchange or 100% refund with no questions asked. View More In Party Decorations & Supplies. If you have any questions about this product by TacLuxe, contact us by completing and submitting the form below. If you are looking for a specif part number, please include it with your message.